Experience Soft1’s Series 5 seamless user interface and its flexible business architecture that moves at the speed your business does. At a glance, your people can view what matters most and achieve more with less disruptions. Promote efficiency with a collaborative, intuitive work environment. With Soft1 Series 5, your people can customize their workspace, including preferences, formats, and fields, while enjoying powerful industry-specific functionality. Promote efficiency, speed and excellent customer service regardless of location or device. Extend your people’s reach while away from the office. Empower them to execute all of their tasks in just a few taps on a smartphone or tablet. Soft1 ERP Series 5 delivers extensive functionality, tailored to your business needs. Streamline your processes, speed-up your daily transactions and improve financials and customer service. All from a single, real-time system. Keep your business on track, work more efficiently and keep your customers happy. Soft1 ERP Series 5 includes best practices and preconfigured processes to provide your business with a simplified, easy-to-manage, high-performance IT system. SoftOne’s extensive network of partners, can get you up and running in no time! Our partners offer your business a broad range of value-added services to help you plan, implement, integrate and manage the best solution for your specific needs. Work more efficiently and make faster, more informed decisions, with insightful information. 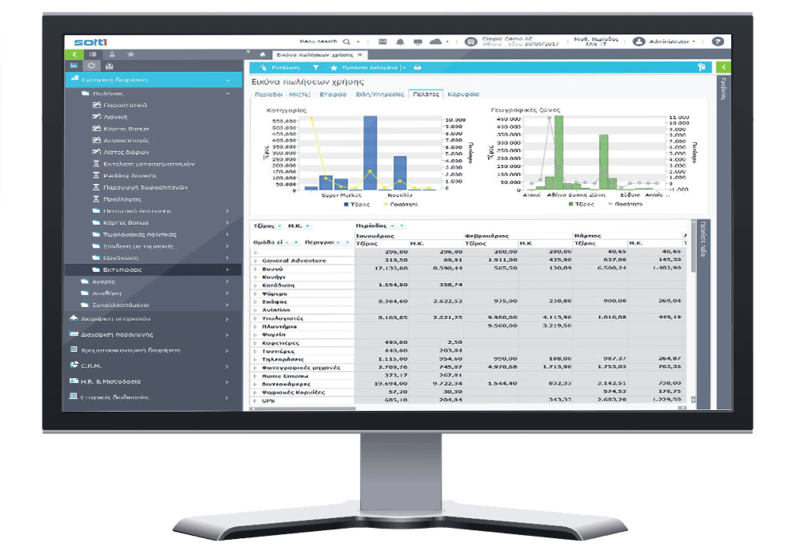 Soft1 Series 5 utilizes the award winning QlikView application that brings insights and clarity to where you need it the most: the point of decision. Better manage every aspect of your business with the leading Soft1 cloud solutions and experience significantly lower operating costs without compromising the quality of your operations, products or services. Remove all the complexity and implementation costs, with a true cloud Soft1 solution. Enjoy the flexibility to innovate faster and create even greater value for your customers. Implement Soft1 Cloud ERP Series 5 to your requirements effortlessly within weeks, instead of months. Soft1 cloud solutions eliminate high cost of hardware and IT resources. Simply enjoy a subscription-based model that is kind to your cash flow and resources. Quickly gain access to the most advanced SaaS solution without having to invest even in a computer server. Free up your IT people to stay focused on providing value-adding solutions for your business. Take advantage of SoftOne’s massive experience and trust your entire IT infrastructure in professional hands. "The transition on cloud operation offered a modern ERP system to our company, with configuration abilities according to our development demands. The advanced Soft1 Cloud ERP solutions provide our employees with easy and reliable access in business data, without geographical or time restrictions, facilitating the installation of big-distance projects." Menelaos Samaras, CEO, G.Samaras S.A.